Out on tour promoting 'The Taking,' the latest album by Loaded, the band he fronts playing guitar and handling vocals, Duff McKagan spoke with our sister site, Spinner. In the piece, the legendary musician talks about his experiences working with Scott Weiland, Perry Farrell, and Axl Rose. Spinner: Yes, mercurial frontmen. Whether it's Axl or Weiland or even recently Perry Farrell. Well, he's great. Perry's awesome. I was in a really cool spot with Jane's. I just went in to help write a record with them. Those guys have a long history, and I'm not part of it. I didn't have any baggage with those guys at all. I played a few gigs with them. And [Perry] is such a great frontman. He's really that guy who can just turn it on. Same with Weiland -- he's that guy too. He can get [the attention of] a whole arena. And of course, Axl was born to be the guy he is. That's the only way I can really put it. 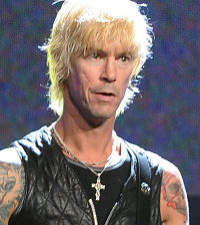 During the conversation, McKagan also talks about his finance column, his early love for punk rock, and even drops an Yngwie Malmsteen reference! For the full interview, head to Spinner. Duff McKagan's Loaded just released 'The Taking,' their second full length album, which you can stream in its entirety over at Spinner's listening party. The band will be hitting the European festival circuit this summer.